The Academy of International Business (AIB) Executive Board has announced that it will award the Journal of International Business Studies (JIBS) Gold Medal to Miami Business School Professor Yadong Luo. The prestigious Gold Medal will be given to Yadong as a “tangible recognition of his many intellectual contributions to the field of international business." Coinciding with the Journal's 50-year anniversary, Luo will receive the Gold Medal during the AIB 2019 Annual Meeting held in Copenhagen on June 24-27, 2019. Presenting the award will be Anne Hoekman, managing editor of JIBS, the top-ranked journal in the field of international business. 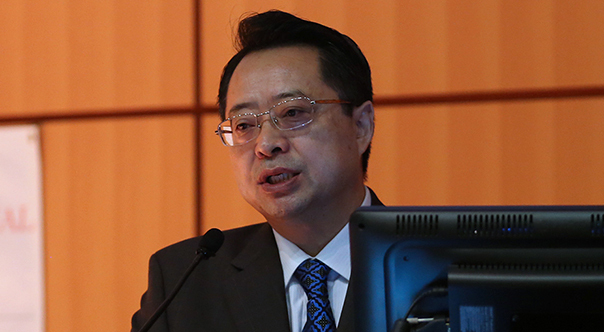 Yadong Luo is the Emery M. Findley Distinguished Chair and professor of management at University of Miami. He is also an elected fellow of Academy of International Business (AIB) and the recipient of two dozen research, teaching and service awards. He received the Faculty Senate Distinguished Scholar Award in 2009 at the University of Miami, the University's highest recognition awarded to its faculty. Luo has emerged as the world’s top research scholar in international management since the mid-90s. He has published over 170 articles in major refereed journals in management and international business, including AMJ, ASQ, AMR, SMJ, JIBS, JAP, Org. Science, among others. He also authored more than a dozen books and about a hundred other publications. His research interests include global corporate strategy, global corporate governance, international joint ventures, and management in emerging economies, among others. Luo’s research record includes seminal pieces on important and timely topics, such as co-opetition in international business, business-government relationships, cross-cultural cooperative strategies, multinational enterprises in emerging markets, and international expansion of emerging market enterprises. He is also an expert in research on several frontier issues, such as dynamic capabilities in global business, cultural friction in international interactions, organizational justice in inter-firm relationships, anti-corruption in organizations, opportunism in inter-firm exchanges, global language design, and global dimensions of corporate governance. His writing on the recent development of business and management in emerging markets, notably China, is particularly path-breaking and offers a wealth of understanding of this critical context and business activities that are unfolding there. According to Google Scholar, his works have been cited over 30,000 times by other scholars. Luo was ranked the world’s most productive author in leading international business journals between 1996 and 2008 by International Business Review in 2010 and between 2001 and 2009 by Management International Review in 2012, most prolific author on Asian management by Journal of Management Studies in 2008, and most impacted author on Chinese management between 2000 and 2006 by Asia Pacific Journal of Management in 2007. In 2016, he was ranked #2 worldwide in management and #6 worldwide among all business school faculty concerning journal and research contributions.